Dr. B's birthday lunch at Bualai Taste of Thai in Port Hope - yum! We enjoyed a delicious homemade ice cream cake that Berni made to celebrate Dr. B's 25th birthday! 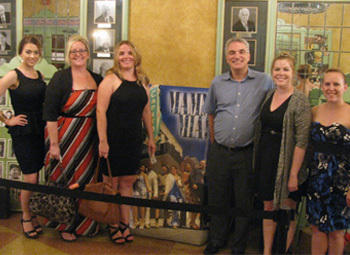 Dr. Benedict took our team to see Mamma Mia at the Capitol Theatre on Thursday August 25, 2016. We channelled our inner "Dancing Queen" and had a great time watching a fantastic performance filled with song and dance and lots of laughs. Thank you to everyone who joined us for our sports mouthguard clinic throughout July and August. It was another great year! A donation will be made to KidSport West Northumberland. 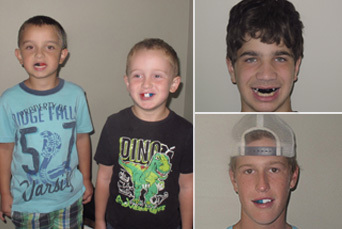 Sports mouthguards are important for protecting your child's smile. We also provide custom mouthguards for adults who play sports. Click here to learn how you can protect your smile with a custom-fitted mouth guard from Port Hope Dental! Do you wake feeling unrested? Does your spouse say that the noises you make during the night sound as if you are choking or gasping for air? Snoring refers to the vibration sound in your throat, mouth or nose that may occur during sleep. It is estimated that upwards of 45% of adults snore occasionally. Dr. B's birthday cake was so good we had to share it with our patients - just be sure to brush your teeth when you're finished! Depending on the size you wish to make, you'll need several ice cream sandwiches and 1-2 tubs of cool whip, along with skor bits, shaved chocolate and any other candy bars of choice.